From sensitive line work and subtle blending to expressive marks and deep tonal work, Derwent XL Graphite is smooth and refined. The chunky shape is captivating, intuitive and great fun to use. You can even add water to the mix for splashes and washes. There are six colours in the range: two natural graphite, two warm tones and two cool colours. Experiment with making marks! These blocks are really effective when used on their side, edges and corners. Smudge and blend to create different outcomes and give an even coverage. You can even add water! 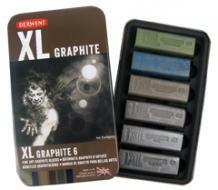 As these graphite blocks are watersoluble, you can create washes or even spritz to create splatters. Containing the full range of XL Graphite blocks, you can unlock a world of creativity in no time. 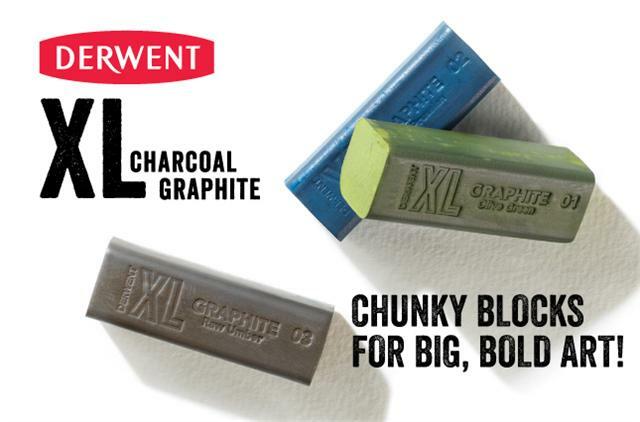 Be the first to review “Derwent XL Graphite Blocks – Tin of 6” Click here to cancel reply.